Ndanda priory bid farewell to our dear Sr. Andrea who left for good to her beloved priory Norfolk USA. On 13th July we had a short program to thank God for all blessings upon Sr. Andrea and upon our Ndanda priory. 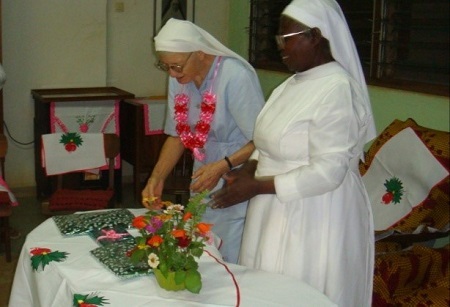 We thank God for all those years which our Sr. Andrea served God’s people in Tanzania faithfully and tirelessly. We continue ask God to grant Sr. Andrea much joy, energy and blessings so that she may continue serving Him wherever she may be. Sr. Andrea gave us a short history of Ndanda priory, it was very touching. Mother Prioress Terese asked Sr. Andrea to write something concerning what she has told us. She promised to do so when she will be in Norfolk. Sr. Andrea thanked the community and lastly she said,” my thanks come from the bottom of my heart.” We thank you dear Sr. Andrea for the services you offered to our priory. May God bless you always.